At our house eating fresh tomatoes everyday ended sometime after the first week in January. At that point I had about a dozen nice looking tomatoes left, but they were not ripening. I started to throw them out (I don’t care for fried green tomatoes), but decided to keep them and see what they would do. I had to throw away six. The other six still look pretty good. One felt and looked perfect for slicing. So, we had it for lunch today along with one of the 6 onions I have left. 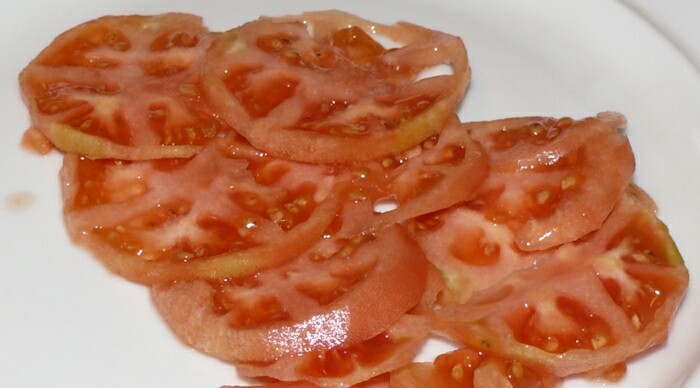 Tomato picked in November and sliced for lunch February 12th. I can hardly wait for the up and quickly-coming tomato season! and freezing enough for winter use. I’ve adjusted the third goal to: freeze more of the fabulous tomato sauce made from roasted tomatoes, rather than tomatoe essence which had been my preference for years. I’ve added a fourth goal. I want to try every variation of roasted tomatoes for snacking, appetizer and condiment use. The idea is to bake the tomatoes in the oven for about 3 hours until shriveled and dry, but with a little juice left inside. Then eat them — or add to pasta, or cover with olive oil and save ’till later. Variations are in roasting time, oven temperatures, and whether or not you add olive oil and spices like minced garlic. In one review I read of a lady who picked fresh tomatoes out of her salad —– but absolutely adored roasted tomatoes. She had to make a lot because she would eat so many right off the “cookie-sheet” before she ever got to serve them. Everyone seems to agree the best tomatoes to use for this purpose are Roma (often called paste) tomatoes. I’ve never been a big fan of Roma tomatoes, but then I’ve never eaten them roasted. I’m especially looking forward to the unique shape: 6 inches long by 3 inches wide! The pictures were beautiful! This one’s a hybrid. It’s a small 2 oz red pear shaped tomato with excellent flavor. They are said to have an extra long shelf life which really appeals to me. If I start them late I can probably have a good picking about the time frost is expected. Then —- roast them through the fall. In all the years I’ve grown tomatoes I’ve always grown indeterminates that produce continually until frost. Window Box Roma is a determinate. So all the fruit will ripen within a short period of time. But — as much as I don’t like that thought — I just have to try them. I’ve always liked tomatoes. The sauce I made from roasted tomatoes this year certainly took it to a new level. I can just imagine how I’ll feel with several variations of roasted tomatoes under my belt! If you’re a tomato lover (and maybe even if you’re not) you might feel the same. I love the idea of roasting the tomatoes to preserve them. Getting very anxious for spring planting time. Well Theresa, you’ll be happy to know my one bed is indeed now COVERED with straw (and has been for a few weeks). Even though i told myself I would begin with only ONE bed, I actually have about 1 regular bed and one “baby” bed! I am so looking forward to gardening this way this year, any recommendations on what I should plant in such a small beginner area? I also have flower/shrub borders on the front of the house – I am guessing I could even plant something in there but not sure what I should put there…herbs? berries? this area gets little to no “direct” sunlight so any advice would be great! Thanks for sharing your gardening wisdom with us beginners! Planting time is almost upon us, so we don’t have long to wait! Congrats on your additional baby bed! As far as what you should plant ——easy and obvious ———what you like. I don’t know how big your bed is, but probably you’ll want a tomato or two, and cukes. How about a bit of lettuce, some onions and maybe a few snap beans. If the front of your house gets no direct sunlight then herbs and berries won’t do well there. They need sun. Plant shade loving perennials like hostas. Best of luck! Have fun with it!